DETAILS: A contemporary twist on a traditional item, our personalized rectangular-shaped Cufflink Bars are small but striking and add a little sparkle to any tuxedo or dress shirt. Made in an easy-to-wear shank design, they’re attractive but not too flashy. Polished metal finish. 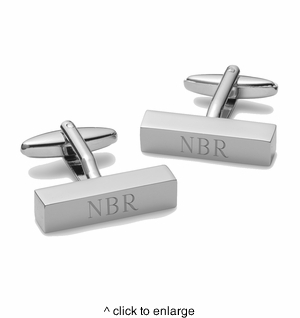 MARKETING: Beautiful cufflinks for that special someone.